As a lot of star players are injured the the league right now, we bring you the roster for NBA 2k14 in which all the players are healthy or not-injured. You can finally play with the latest official roster (as accurate as of February 26th, 2014) with no players injured. You can use to roster to play a quick game or start a new Association or MyCareer mode. 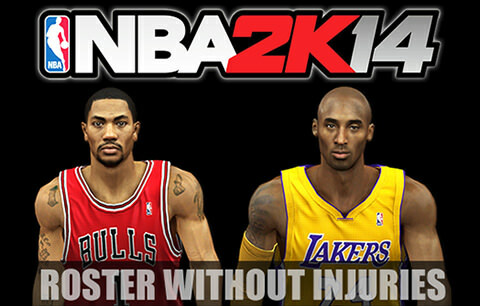 Check out more below and download the latest NBA 2k14 no-injuries roster. All injuries have been removed. Default overall ratings and individual attributes. Removed all the Hot and Cold streaks. Edited team rotations. All superstars as starters. Updated overall ratings and individual attributes. Hot and Cold streaks are applied. Current team rotations. Injured players are on reserved list. Download and extract using 7zip. Copy the NoInjuriesV1.ROS or NoInjuriesV2.ROS or both and paste it in your NBA 2k14 Saves Folder. Play NBA 2K14 and go to ‘Options’ » ‘Load / Save’ » ‘Load’ » ‘NoInjuriesV1’ or ‘NoInjuriesV2’ roster. Done! Play with the No-injuries roster.